It's Chelsea: Dealing with Trust issues & being let down. 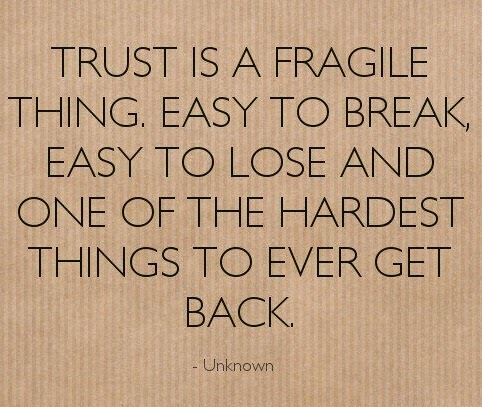 Trust is a very sensitive subject and I can probably speak for everyone that at some point in their life, their trust has been broken. I'm not here to be bitter or cynical about the entirety of the human race (bit of an exagerration?!) but I am here to hopefully try and help you try and overcome these unfortunate situations if it ever comes to it. Being only 23, I am in no way an oracle of this topic but I've had my fair share of having my trust completely and utterly broken and have been left feeling so upset and angry which has ended up affecting my other relationships with people because I'm scared that everyone is going to do the same. I end up putting up a barrier of self defense up to protect myself from being hurt again. The saying "innocent until proven guilty" still applies but it does come with warning labels. It is difficult for me to completely trust someone now but I'm working on it. If you don't have high expectations from someone, such as your boyfriend, girlfriend or friend, then you can't possibly be let down right? But we are all human and of course we have expectations. Just realise that no one is perfect and everyone, including yourself has the ability to let someone down or break someone's trust. Try not to let past relationships affect your new ones - easier said than done. There ARE some good people out there, you just need to find them! Try and forget past relationships and don't dwell on the bad parts, but think of what you have learnt from it instead. Once the trust has been broken, it is very difficult to get back to where you originally were in the relationship even if you are both more than willing to forgive and forget. It may be easier to just leave now rather than prolong the pain, only to have the same ending further down the line. Obviously everyone has different circumstances but I think this can be applied to the majority. Who of you reading this can put your hand up to say that you've never had your trust broken by someone you 100% trusted? If you are in that category, you're so lucky! This was a bit of a sad post... Normal beauty/fashion posts will resume this week! What other advice can you offer on this topic? I would love to hear from you.